(Left) "Rhymefest," also known as Che Smith performs onstage in this July 29, 2016, file photo. (Right) Kim Kardashian West is seen walking in Soho on May 9, 2018 in New York City. The whole feud began yesterday when Rhymefest tweeted at Drake, who just released a Kanye diss track on Friday, for assistance for the city of Chicago, saying that Kanye West had "abandoned" the Windy City and seemingly his non-profit organization, Donda's House, which helps bring arts to disadvantaged youth and is named after his beloved late mother Donda West. "I'm asking @Drake to help the part of Chicago Kanye has Abandoned! Please contact @DondasHouse," wrote the disgruntled rapper. After Donda's House's twitter was flooded with questions, the organization tweeted a statement, asking that in light of Kanye's recent inflammatory remarks and subsequent boycotts of the rapper, that patrons and supporters "not penalize or throw away their support, respect or advocacy" for the organization. 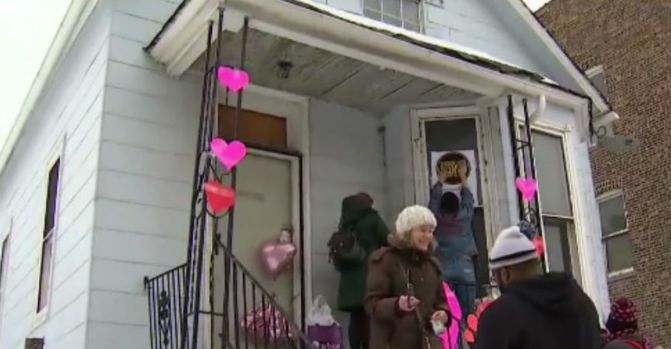 In honor of Valentine's Day, preservationists and others gathered for what they called a "heart bombing" event. The goal is to turn Kanye West's childhood home into an arts center in the South Shore neighborhood, expected to open in 2020. NBC 5's LeAnn Trotter has the details. The statement also made a serious claim, "As we seek to support to convert Kanye's childhood home into a recording studio, museum and learning space--we have been unable to secure the financial support from Kanye despite multiple attempts and despite those early conversations about his plan of support and advocacy of the youth in our programs." Reports surfaced today that Chicago-native Kanye West is planning to start an organization to tackle some of the city's problems. NBC 5's Anayeli Ruiz has the details. In a flurry of tweets, Kim called out Rhymefest, writing, "U haven't been right since u got kicked out of the studio in Hawaii wearing fake Yeezy's @RHYMEFEST. You're over leveraging Kanye's name & asked Kanye to donate money to u so stop w your fake community politics & lies. Truth is you haven't been able to sustain the foundation [sic]." The "Keeping Up With the Kardashians" star added, "I saw you at our studio a few weeks ago so why didn't you bring this up then @RHYMEFEST ? You were trying to get Kanye to listen to your sub par beats. You have the audacity to use Kanye's mom name to try to shed a negative light on Kanye [sic]." The 37-year-old star, whose children are 4-years-old, 2-years-old and 4-months-old, ended the tweet storm by writing, "Sorry to all of my followers for flooding my timeline I know you have no idea who Rhymefest is." Following Kim's tweets, Rhymefest, whose real name is Che Smith, responded by tweeting, "Hey Kim Kardashian good to hear from you. Here's my response," along with a lengthy and passionate statement calling out the reality star for never having physically been to the location or spoken to the organization's director. "I encourage you instead of attacking me personally, to Google us, watch the videos on our YouTube channel featuring our work and come actually speak to the young people who have actually been involved in our program before you, in your position of privilege from God knows where in the world, via social media attempt to dismantle this valued community asset." Following the feud, the organization released a statement Saturday night letting people know that they would be dropping the name "Donda's House." The statement, released via Twitter, read, "Due to recent events that have occurred over the last 48 hours, we have decided to no longer use the name Donda's House Inc. This has been an incredibly difficult decision but the social media quotes from Kim Kardashian West, as well as the expressed interest of her family running the organization, has brought us to this decision." Kim responded with a series of tweets Sunday. Kim began the tweets, "Let me break this all the way down..." She followed up with, "Kanye and Donda started a charity called Loop Dreams. When Donda passed, they changed the name to Donda's House. Kanye paid Rhymefest a salary to run it." "After several years of lack of performance from the organization and Kanye going through personal financial issues, he could no longer fund salaries. Rhymefest asked to take it over and Kanye agreed with no financial strings attached," continued Kim. "Kanye gave his 'friend' an opportunity to run an organization on his own. 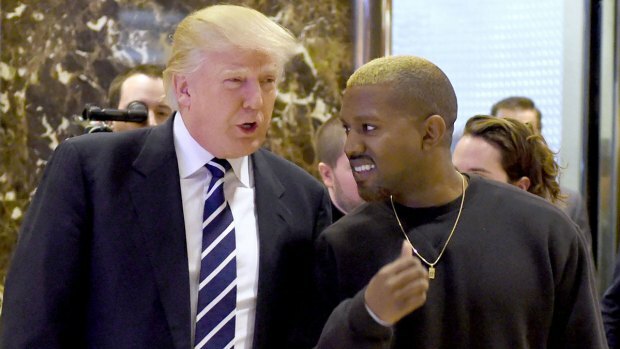 So now that Kanye is being publicly shamed for not being involved makes no sense and, at this exact time, just seems very calculated." The mogul continued, "I have and will always applaud any efforts to give back to the community. To fight for justice and to help uplift the youth. But I will never tolerate someone who was close to Kanye who attempts to use his late mother's name to publicly shame him while pretending to do good. She ended the string of tweets, "I will always ride for my man!" Meanwhile, Kanye has been silent on his Twitter.